Samsung and Microsoft recently struck an unusual partnership: Buyers of new Samsung Galaxy S8 phones will soon be able to load Office and other productivity apps onto those Android 7 phones via Wi-Fi when inside Microsoft Stores. With the Windows apps on a Galaxy device and the new Samsung DeX docking station, business users will be able to access Microsoft Azure cloud services, and more, through the large monitor and full-sized keyboard and mouse, an analyst said. The partnership was first announced somewhat quietly a week ago. Microsoft said customers can now pre-order the Galaxy S8 and S8+ inside Microsoft's physical stores, with deliveries starting April 21 -- Samsung's release date. The S8 will cost $750 and the S8+ $850. On Thursday, Microsoft added a few details via two emails to Computerworld, saying that the pre-orders apply to S8 and S8+ devices running on the AT&T network. Unlocked devices that will work with any carrier are coming "in the future," a spokeswoman added. When a customer buys a Galaxy device in a Microsoft store, a sales associate will help with an in-store connection to Wi-Fi to load apps such as Office, OneDrive, Cortana, Outlook and more, Microsoft said. The potential to buy unlocked phones with Windows apps is significant, analysts said, given the 20% or greater savings enterprises can achieve with unlocked smartphones that don't require a service contract. Samsung has sold unlocked smartphones in the past, but has recently begun making a greater push in that direction, just as U.S. carriers have increasingly wanted to step back from smartphone subsidies. Business users may come out winners in the Samsung-Microsoft arrangement, while both companies expect to benefit as well, analysts said. Galaxy S8 customers using the loaded Microsoft productivity apps stand to gain access to Microsoft Azure cloud services, productivity software with Office 365 and enterprise workflow with SharePoint, said Gartner analyst Werner Goertz. 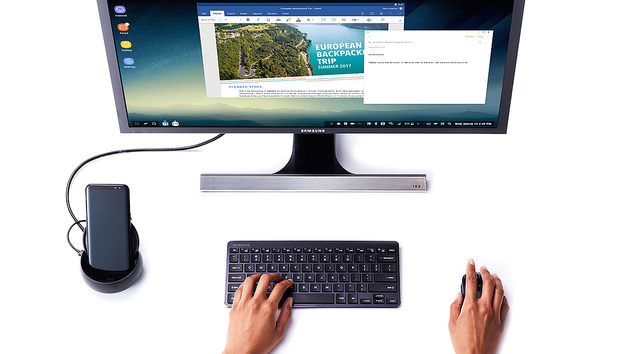 With the new DeX docking station that Samsung announced alongside its new phones, workers could dock a new S8 and run Windows apps on large displays and a full-size keyboard and mouse. And "think about the [many] use cases that DeX [docking station and large screen] will open up for Samsung in the workplace," Goertz said. Even though Microsoft and Samsung have agreed to embark on an unusual partnership, there have been some disagreements. Goertz said Microsoft was planning to brand the Galaxy devices running Windows apps as a "Microsoft Edition" of the S8. "This was technically speaking incorrect, and Samsung has vehemently disagreed with Microsoft's terminology of 'Microsoft Edition,' " he said. Microsoft benefits somewhat in the partnership with Samsung, although the potential benefits are iffy, given Microsoft's difficulties in the smartphone arena. "By more closely aligning with the mobile phone leader, Microsoft will gain better control over a mobile device platform, since Nokia didn't work out," Goertz said. Smartphones running Windows Phone and Windows 10 Mobile have become "basically irrelevant" in the global smartphone market, with less than 1% share, IDC analyst Ryan Reith said in a recent email. "It's tough to rule Microsoft out from a mobile OS perspective forever, but in the next three to five years, the only way that trajectory changes is within some sort of overhaul to Windows Phone or whatever it is being called, or some seamless connection to app stores like Google," Reith said. However, Reith said Microsoft's Continuum "concept is interesting and has caught the ear of industry hardware" manufacturers, as demonstrated by the Samsung partnership. Continuum allows users to connect Windows software across a phone to a tablet and PC. Microsoft recently said it will roll out a Windows 10 Mobile Creators Update on April 25.